LR News: Issue Three has arrived! (And we’re off on hiatus). 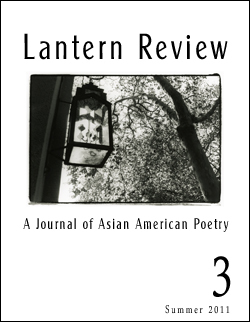 It is with great pleasure that we announce the arrival of Issue Three of Lantern Review! Our stellar lineup of contributors also includes: poets Jen Y. Cheng, Wendy Chin-Tanner, Shayok (Misha) Chowdhury, Oliver de la Paz, Clara Changxin Fang, Kim Koga, Eugenia Leigh, Kim-An Lieberman, Vikas K. Menon, Pos L. Moua, Hong-Thao Nguyen, Melissa R. Sipin, Mai Der Vang, Andre Yang, and Sandra M. Yee, as well as visual artists Joseph Marconi Calindas, Michelle Chandra, and Natalia Ricotta. To enter the issue, click here, or on the cover image at the top of this post. We hope that you enjoy the issue, and would love to hear your feedback on both its content and its technical navigability—simply send us an email at editors [at] lanternreview(dot) com. In the meantime, we are heading off on a late-summer Blog Hiatus (during which time we’ll be taking a break from posting to the blog, but will still be contactable via other means, like email and Facebook), and wish you all the best until we return on October 3rd.